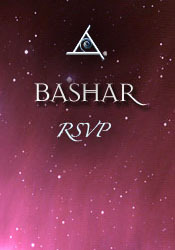 This special Bashar event is the first channeling since 1998. Bashar shares a new perspective on the dramatic changes occurring on our planet. He calls this session "RSVP" as it is an invitation for us to decide whether we want to have contact with extraterrestrial civilizations. One day while hiking I sensed an extraterrestrial intelligence. What type of energy was that? What civilization or civilizations? You talked about being in the now. Where does it fit in as far as being in the third vibration, fourth vibration, fifth vibration? Meditation seems to bring me to higher consciousness. But then sometimes I lose it. Do you have any techniques? Are there any tools to create your reality more quickly when you want to change a behavior? With my eyes, I’m able to see faces of all different forms with no fear. Can you talk about the application of viruses? Should we expect to experience interactions with viruses within our genetic code in the next few months or years? I saw a space craft at fairly close range some years ago when I was much younger. Was there a specific purpose in me seeing that craft? There was a woman who viewed this event with me. Was she really just a person who lived across the street? Was there any kind of interaction? I’ve also had dreams about being on craft. Is that the same thing that you’re talking about? Are you aware of the mantra Nam Myoho Renge Kyo? How does that work with the Four Laws? Would you address the two mysterious glyphs that could be the Aricebo 1974 response glyph? If we are whole, why do we enjoy the process of healing so much? I feel a very strong affinity to Essassani. What is our galactic heritage? Which families are we galactically, genetically connected with? Why is Earth such a center of activity at t his point in time compared to other planetary systems?